This template is coded in HTML5 with CSS3 enhancements for supporting browsers, and is compatible back to Internet Explorer 7 (it will display in IE6, but I no longer actively code for this archaic browser and cannot guarantee all effects will work). I had initially designed this template in response to ThemeForest's "Out of the Box" competition. 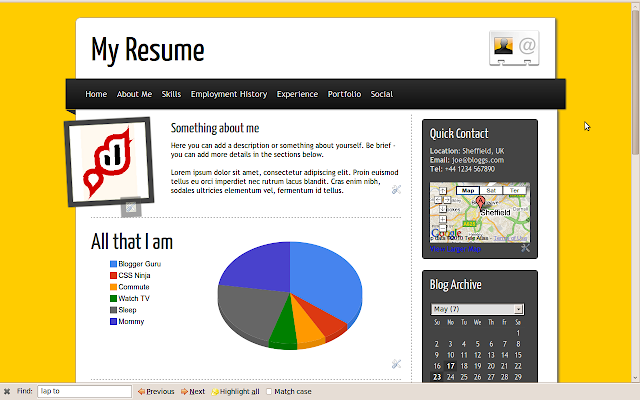 My concept was to design a new spin on the traditional "resume" using interactive graphical elements. In choosing to design this for the Blogger platform, I hoped to ensure required customizations are easy to implement, and that users of this template can set up an online presence using Blogger's free service at minimal cost. Infograbbit is available to purchase through ThemeForest for $17 (with a $2 reduction for pre-payment). The download package includes all template files, images, gadget codes and documentation required to install and edit this theme. I hope you enjoy using this theme as much as I have in designing it! Please feel free to offer your comments below.